Stormzy was the big surprise at a memorial gig for the rapper Cadet who died in a car crash last month. The concert in south London was on what would have been Cadet's - real name Blaine Cameron Johnson - 29th birthday. Speaking to Radio 1 Newsbeat as he came off stage, an emotional Stormzy said: "He was a legend. Every single time I saw him he said 'I love you'." 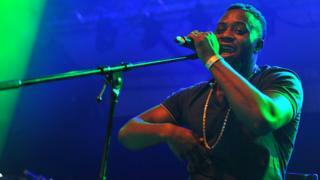 Also on the bill at the sold out O2 Academy in Brixton were Dave, Lethal Bizzle and Krept and Konan. At the tribute - streamed live on YouTube - Stormzy said on stage: "Hand on my heart there's nobody that would have appreciated this more". Cadet's cousin Krept - of rap duo Krept and Konan - closed the show by bringing his family on stage as the crowd sang happy birthday. They received plaques for the late rapper's most recent hit Advice selling more than 200,000 copies. Lethal Bizzle told Newsbeat: "I just wish Cadet was here to see how much love is getting shown." I lost count of the amount of times that word was used on the night. Whether from an artist who worked with him, a fan who'd bumped into him at a concert or a DJ whose show Cadet had appeared on - all spoke about how he was never someone shy about expressing his emotions. People handle death differently - and backstage people were in tears, laughing or just silent. Stormzy is an artist I've interviewed countless times. We chatted for two and a half minutes backstage. I reckon 10 seconds of it is suitable for broadcasting. He was visibly choked up when asked to explain why he felt it important to be there or put into words what Cadet's legacy would be. As the sold-out crowd sang happy birthday cadet at the end of the night, production staff, artists and family members gathered backstage for one final hug and prayer for the 'underrated legend'. Fans from across the UK travelled to Brixton for the event. Jake - pictured above - from Birmingham described Cadet's death as tragic but wanted to have a good night in his memory. "On Instagram he had such a big personality so it was important to come out to support him." Money raised from the event will be donated to charity.